Last night I watched ‘And Now His Watch Has Ended’. I know there was alot going on in the episode but all I can think about is the last scene with Daenaerys Targaryen. It is rare to see such an epic, perfectly executed piece of television. Everything about it was magical. Hubby and I worked out a couple of episodes ago that Valyrian was Dany’s mother tongue and that she could understand every despicable and disgusting thing that the slave master, Kraznys Mo Nakloz (Dan Hildebrand) was saying about her. 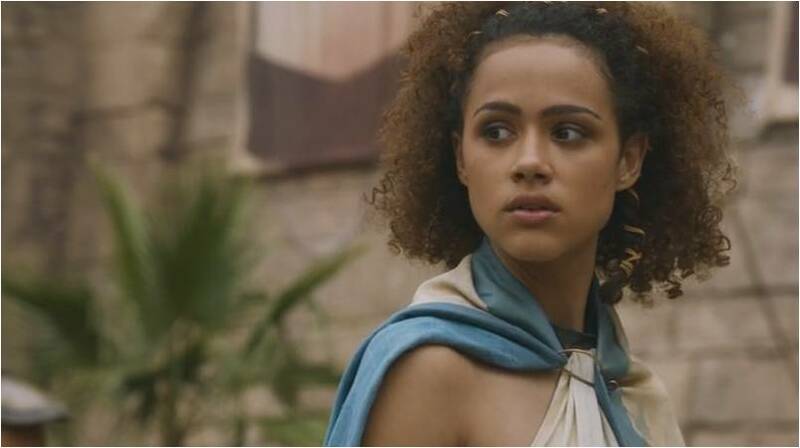 It also meant that she understood the diplomatic way that Missandei (Nathalie Emmanuel) was translating. It was always going to come to a head but the result far exceeded any loosely held expectations. Emilia Clarke is glorious as Dany and displays an elegant and intimidating balance of composure, determination, passion and self-control. Others will underestimate her because she is a woman and they will be left burnt in the dust (as Kraznys discovered). Dany listens to the words of her advisors but sets her own strategy and does not seek permission or assurance before she puts it into place. More and more she is proving to Ser Jorah Mormont (Iain Glen) and most recently to Ser Barristan Selmy (Ian McElhinney) that they may be her advisors and look out for her but that she is definitely the one in charge. Her leadership, faith in herself and in others is a risk; but because of who she is – which is so much more than just a name – people will follow, fight and lay down their lives for her. Dany is all about the calculated risk. She was able to play along with the game and keep her cool until the time was right, grant the Unsullied slave warriors their freedom then ask them to follow her as free men. She took in what Ser Barristan said about men freely willing to fight and die for their leader, as opposed to being ordered to do so. 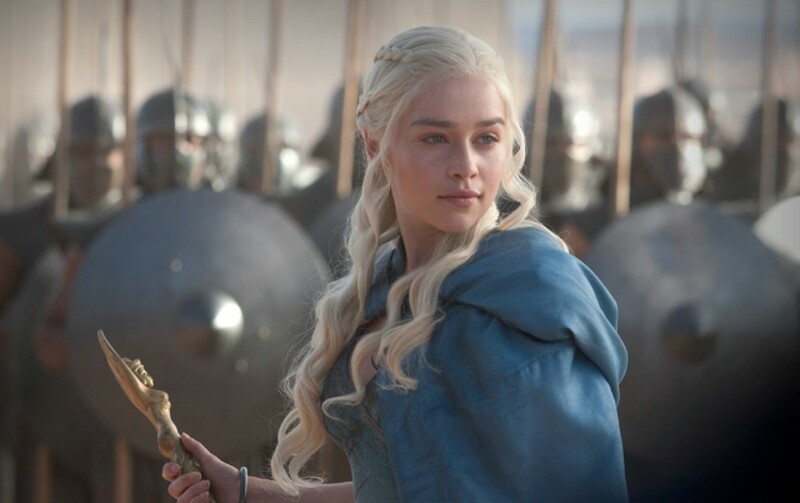 She now has her loyal army, her inner circle and last but absolutely not least her dragons. Her beautiful, powerful dragons. When she offered to give one away in the negotiations I had a feeling it would not end the way Kraznys thought. Oh, the seduction of power, how it clouds the mind. Dany cared for the dragons before they were born and when they hatched, Dany was reborn with them. She is their mother and it is an inseparable bond. It was genius that once she handed over her dragon Kraznys was so focussed in trying to control the dragon that he didn’t even notice that Dany had started speaking fluent Valyrian. With one word from Dany in her native tongue Missandei’s sudden head turn showed that she grasped the meaning of everything that had happened up to that point, although she could not have foreseen what would happen next. The closing image is beautiful and formidable. King’s Landing has no idea what is coming for them. Speaking of King’s Landing, although I enjoy all the politics and manipulations they all seem so small and petty when compared to Dany’s journey. I cannot wait till they realise that dragons (like the Targaryens) are not extinct like they currently believe! With all that Dany has gone through to reach this point, I believe she sees becoming Queen as her life mission. It is not just about power and influence – it is her one true destiny and she will remain loyal to that above all else. As someone who has not read the books (although I will at some point in the future redeem myself) I hope this is the case. I can only wish that there is a time when King Joffrey (Jack Gleeson) comes face to face with Dany and her dragons. I can only hope if that moment arises that Cersei (Lena Headey) is no where in sight and that there are no possible means of escape behind him. Did you enjoy this episode as much as me? What are your highlights?